Service Costs > How Much Does Tree Removal Cost? When it comes down to removing a tree, there are going to be some factors that you’re going to have to put into play. You will have to consider the tree’s location, its height, as well as how much it weighs. You will also need to scope out the area. Are there power lines? Is a house nearby? 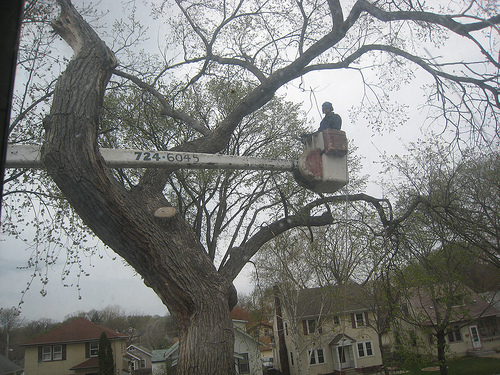 There are many types of tree removal types that include rigging which involves the worker to start at the top and work their way to the bottom. As they go down, they will chop each tree branch one by one. Another option is via a crane. The crane is usually used for dead trees or trees that are unsafe to cut done. The crane will simply pull the tree back to a safer location, allowing the workers to cut it down piece by piece. Craning is going to require more than one worker on average. On average, professional tree removing is going to cost anywhere from $250 to as much as $15,000+ per tree. A typical job at a house is going to cost anywhere from $600 to $3,500. A smaller tree that is no larger than 25 feet is going to generally range around $100 to $400. If there’s a chance that there are obstacles nearby, you will want to increase this price by 25 to 50%. A tree that is around 30 to 60 feet tall will be around $500 to $1,200. Again, obstacles are going to increase the price. Any tree that is larger than 100 feet tall with no obstacles in sight will be in the low $1,000 figures. If a tree is fallen down on your property, this job won’t seem as complex as you would think it is. Most professionals will charge $100 to $225 to remove a fallen tree. If you need a few branches moved away from a power line, this could cost $100 to $200, depending on the number of branches you need to have removed. There are a lot of scenarios, and for that reason, we highly recommend using HomeAdvisor.com to gather multiple quotes in your area for free. With this service, you simply explain your job and contractors will contact you with quotes with no obligation. According to HomeAdvisor.com, they note the conditions are based on the tree height, condition, diameter and location. A pine tree is often priced differently than your basic trees such as an oak or maple. If the tree is smaller than 30 feet, plan on budgeting about $150 to $225; however, if the pine tree is larger than this, it could cost upwards of $1,500. To get rid of the tree stump itself, you will want to plan on paying around $100 to $500 depending on the size. They will usually grind it to the ground. Some companies won’t chip the limbs after the tree is removed. If the tree service has a chipper and this charge is extra, it may be an extra $50 to $125 to have your limbs chipped. If there are obstacles in the way, it can increase your quote by as much as 50%. If you are near a utility pole, you may want to have them consult with you first. Clean up fees may be an additional cost, depending on the company. Some people would rather keep the branches since they can use it for firewood down the line. An arborist may charge to come out to the location to evaluate the entire situation. He/she will be able to determine what needs to be done, as well as give you quote. While most companies don’t charge for a consultation, some do. If you live outside of the company’s service zone, additional mileage fees may apply. When you sign up for a tree removal service, the company should cut the tree down right to the stump. Depending on the package that you purchase, you will find that some companies will remove the entire stump for an additional fee. When removing the tree, the company will haul away, as well as clean up any mess that is left behind. They will generally use a shredder machine that cuts everything down in a nice, clean way. If there are obstacles in the way such as a utility pole, or even your home, the company will generally rope the branches and cut them down one, by one. This process will take a little longer. As mentioned above, the size can greatly influence the price tag. A tiny tree won’t cost much, but a bigger one will. Even if the tree is tiny, always be prepared to pay a minimum charge. Oak and pine trees tend to be the higher end because the trunks tend to be much larger than the average tree. Older trees will tend to be weaker and weaker as time goes on. This is especially the case if the tree has already died. Due to this pressure as the tree is cut down, the professionals may deem that the tree is unsafe. If they do deem that the tree is unsafe, they may charge additional fees to lessen the risk. If the tree is closer to other trees that don’t have to be cut down or they are close to the house or power lines, this can bring up a quote. A tree located on a side of a hill or even near a road can cause the price to go up as well. On the other hand, trees without any obstacles can be near the lower end of an estimate. The more stumps the tree has, the more it’s going to cost. If you have a fireplace in your home, ask the tree removal company if they can leave the firewood behind. This is a great way to have firewood for the next few winters. Of course, the amount of wood will depend on the size of the tree. Keep in mind that some companies will charge a log splitting fee if you choose this type of service. Always get everything in writing. By getting this in writing, you will be able to know what’s going to be included. Some companies may charge extra for cleanup or mileage surcharge. Getting it in writing will make sure that you don’t overpay for anything. If you’re purchasing a new home, make sure that the inspector looks at the trees around the lot. The last thing that you want to have happen is to find a tree coming through your roof. Never wait on a tree. The longer you wait, the more it can cost! It never hurts to check with your homeowner’s insurance. What you may find is that some may help cover the costs of your tree removal. A tree may not have to be removed completely. Instead, a simple pruning could help save the tree. If you’re going to remove the tree yourself, you may need a permit in order to do so. You may be able to do it yourself as long as the tree isn’t too big. You may want to get your hands on some tree removing tools that may ease the process. Attempt to prune your trees on an annual basis. When you prune your tree, this is going to allow your tree to grow at a healthier pace. It will also allow tree removal services to have an easier job once the time does come to cut it down. Don’t wait until the last minute to chop it down. This could cause the tree to topple onto items such as the house or even local power lines. These will have to be covered at your own expense. Talk with your local homeowner’s insurance company. Some companies may cover this type of service. If they don’t, there’s a good chance that they may even chip in to help. Homeowner’s that have their own fireplace may want to have the company leave the wood behind. Haul away for food can add up fairly fast. This is a great way to have your own bundle of wood. If the tree is near the power lines, call up the power company and complain. 99 percent of the time, they will come and take it down for nothing. If the tree is in a public area, call up the government and voice your concern. Larger trees can often grow into the sewer. Post an ad on Craigslist. Tell anyone that they can have all the firewood that they want. All they have to do is remove the tree for you. In some areas, it’s common for loggers to remove Pine and Fir trees for free. If this is the type of tree that you need to be removed, some companies may pay you. You can use services such as HomeAdvisor.com. You can tell them what you want and contractors will contact you with a price. This is a great step to take, without having to worry about finding contractors yourself. I had a very large dead oak tree in my front yard. I had two estimates for 1800 and 2500. My neighbor referred me to Atlanta Tree Professionals because of the quality and price. DJ the owner came out and gave me an estimate of 1350. He discounted it 100 because they had another job they could schedule it with in the area. They did an amazing job. It took half a day and they cleaned up great. They also worked around my Japanese maple without damaging it. Very professional from start to finish. I was quoted about $400 for an elm tree in my backyard but I was able to contact my insurance company and it was covered 100%! Be sure to check with your insurance company before getting a quote from a local tree removal service. I’m not sure if I was ripped off or not, but the tree was easily accessible by a truck and there were no obstacles in the way. Two men worked for about six hours and I was slapped with this bill. Did I get ripped off? I paid about $500 for my oak tree in my backyard. It really wasn’t near anything and this also included the stump grinding. They left the logs behind for my fireplace. Paid $445 to remove a dead tree that has been in my woods for more than a year now. I wanted to play it safe and have it knocked down because I didn’t know if it would fall on my house over time. The truck came out and was able to remove it. He did note he needed to use special equipment to reach it though. Had a huge Douglas Fir taken down. It was probably at least 40 feet tall and was starting to invade the other trees in the yard. This price included stump grinding and didn’t really require any special tools.